Since the 1800s, economic interests have driven the asbestos industry. 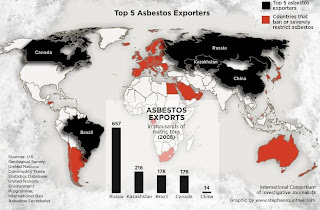 Asbestos is both a profitable powerhouse for the companies that export it, and an inexpensive purchase for those that import it. To make sure the market for the fibers stays robust – despite the many health risks that exposure can cause -- lobbyists have spent more than $100 million promoting their interests with public health officials. Sadly, it seems to be working. Because asbestos remains affordable (and available in large quantities), it is especially popular in rapidly developing nations such as India, China and Brazil. India especially – with companies on both ends of the spectrum, and an asbestos lobby whose annual budget tops out at $13 million – faces a difficult battle in its future fight against asbestos. In 2010, India spent more than $427 million to import Canadian asbestos products. (India is one of Canada’s largest asbestos customers.) And as astounding as that figure is, it only accounts for half of the nation’s asbestos imports. In total, India imports more than 600,000 tons of asbestos each year. 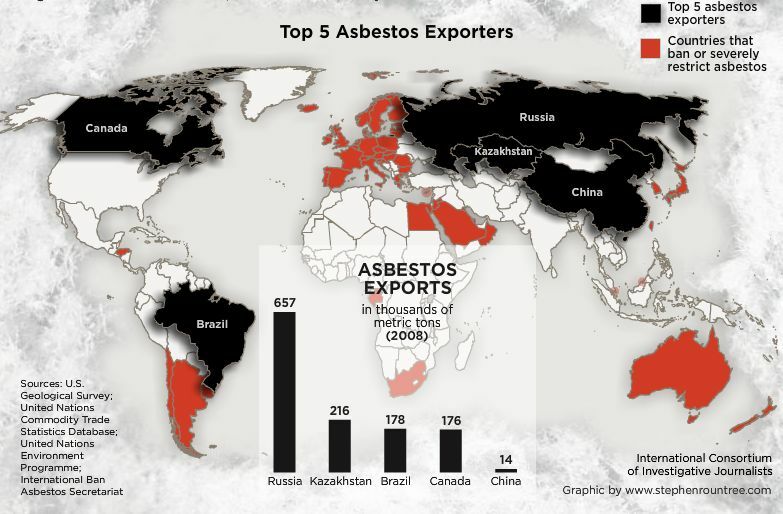 India sources asbestos from several other national asbestos export leaders, including China, South Africa and Russia. India currently stands as the world’s second largest consumer of asbestos – and some experts believe that the national market is growing as quickly as 30 percent every year. Indian asbestos imports are often sent to rural areas, where they are used in home construction. Shingles, siding and flooring products are often used for family houses and public buildings – especially in lower-income areas with access to fewer non-toxic alternatives. Other smaller mines dot the northern part of the nation. Here, workers – including many migrants – extract the fibers from mineral deposits in the ground and prepare it for sale, without access to adequate respiratory protection. Asbestos mines aren’t the only part of the industry that enjoys major success in India. Many companies – such as Visaka Industries – purchase raw fibers to incorporate into other building products. With more than 400 asbestos cement factories in Gujarat alone, repurposing asbestos into other exportable products is also a booming trend in the Indian economy. Faith Franz is a writer for The Mesothelioma Center. She likes to spread the word about the benefits of alternative medicine.